Mykonos Beach Hotel provides the ideal location for visitors who search for a beach hotel in Mykonos Island Greece, but at the same time to be near Mykonos Town. 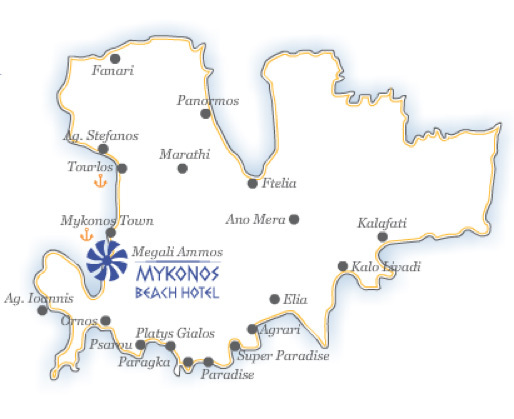 Megali Ammos is considered as the beach of Mykonos Town, as it is located just a 5 minute walk away from its shops, restaurants, cafes and nightlife, therefore makes Mykonos Beach Hotel, an ultimate option for beach holidays, however within walking distance from Mykonos Town. Suitably located within a 15 minute drive from both sea ports and airport and a 10 minute walk away from the central bus station that connect Mykonos Town with the rest of Mykonos Island and its beaches, Mykonos Beach Hotel boosts a very central, however quiet seaside location, away (but close enough) from the dazzling Mykonos Town Nightlife. Furthermore, the rooms’ balcony views across the immense blue of the Aegean Sea, offer relaxing and romantic, tranquil moments.